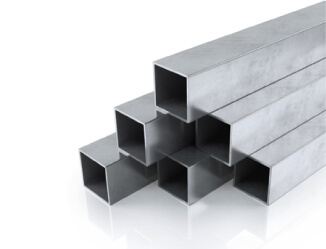 Aluminium hollow sections are available in both square and rectangular sections. Stock bars vary in length however be cut to specific sizes. Available in a range of sizes in both rectangular and square sections and a number of thicknesses. For prices and sizes available, give us a call or fill in a request a quote form. Aluminium square hollow sections are perfect for use in open buildings due to the corrosive resistance offered by aluminium. Similarly with production of columns, aluminium is a light but strong metal aiding the ease of construction whilst using this material. Aluminium may also be welded in certain situations. This material is also very workable and aesthetically pleasing making it perfect for the application of open building designs.